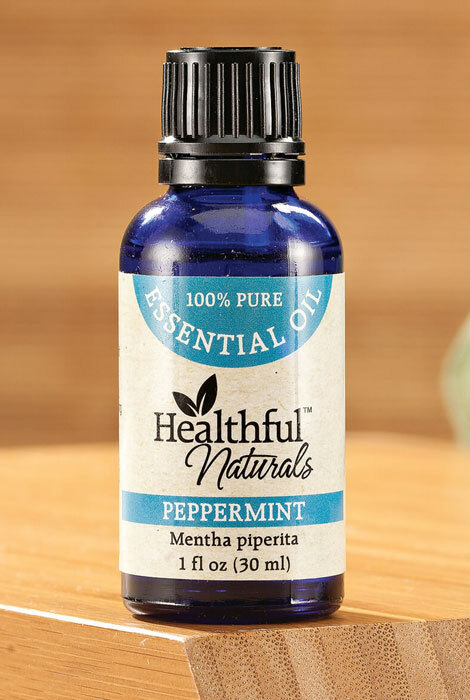 Known for its cooling sensation, energizing properties and soothing effects on the body, Healthful™ Naturals peppermint essential oil is one of the most versatile essential oils. Grown and distilled by farmers near the Himalayas in northern India, the refreshing peppermint oil has an herbal, menthol aroma with sweet undertones and blends well with rosemary, lavender and tea tree. Used in aromatherapy (diluted in water in a diffuser) its calming effects may soothe digestive issues, enhance mental focus and promote respiratory function. When applied topically (diluted in a carrier oil like jojoba, coconut or olive oil before applying to skin), it may relax tense muscles, offer natural analgesic effects and help ease sensitivity to headaches. Not intended for internal use. Complete with orifice reducer cap for slow drop delivery, the generous 30ml (1 oz.) bottle includes approximately 500 drops ... making our 100% pure essential oil an outstanding value. For aromatherapy. Can be used diluted in a carrier oil for topical use. I will continue to buy this prodect. I use in the diffuser, either alone or mixed with another scent. Essential oils aid in so many ways around the house. From personal health, to cleaning supplies. Everyone should have this oil at home. I love this peppermint oil! I put about 15 drops in a spray bottle with water and use it to freshen the carpet or the house. It is also very effective in keeping away insects and spiders. Also fleas. They do not like the citrus smell. This is a great oil. Used it around the kitchen. Gives the kitchen a better smell after cooking and cleaning up at night. Great but expensive for the size. Spray on corners in the kitchen.